Lukáš first appears when Katz loses Švejk to him in a game of cards "twenty-one". Thus the good soldier becomes the servant of Lukáš who from now onwards becomes one of the most important characters in the novel, and apart from Švejk the only one who figures in all four parts. He is also the only officer who is generally described in a sympathetic manner. Švejk subjects Lukáš to a number of ordeals during the time as an officer's servant. Amongst those is the theft of Fox (Max) that causes the transfer to the front, the mishap with the emergency brake by Tábor and the affair with Kákonyi in Királyhida. From the moment when the good soldier is promoted to messenger their relationship improves and Lukáš grows fond of his servant, although he is still irritated by the endless anecdotes. Švejk all the time reveals his loyalty and on a few occasions he even puts himself on the line for his superior. One example is when he devours the compromising letter to Kákonyi and then he downs a bottle of "cognac" in Humenné to protect Lukáš. Jaroslav Hašek actually spends a couple of pages on introducing the reader to Lukáš. This is an honour that no-one else apart from Katz benefits from, and to a much lesser degree. The other officers in the novel are only introduced through dialogues and the plot itself. The author informs us that Lukáš was Czech, born in a village in the south of Bohemia. In nationality questions he sympathises with the Czech cause but is careful to not express it publicly. One of his statements are: "let us be Czechs but non-one needs to know about it. I am also Czech". He is portrayed as an amphibian who speaks German in society but reads Czech books. He treats his men strictly but fairly, he may raise his voice, but he never shouts at them. He is fearless and direct towards his superiors and this may even have cost him promotion to captain. He is well liked by his men, makes sure they are quartered properly during manoeuvres and also treats them with beer and appreciates that they sing when marching. He also knows how to put brutal lower rank officers in their place. Otherwise he has over time been unfortunate with his servants who he hates and frequently replaces. Lukáš is also fond of animals and keeps a canary bird and a cat. It is indirectly revealed that he has served for a while in Prague and that he teaches at a school for one-year volunteers (see Einjährig-Freiwilligenschule (Prag)). In the author's introduction it is not revealed which unit he served with in Prague. As the novel progresses more details about Lukáš are revealed. He was a friend of the ladies, a fact that is graphically illustrated through the encounters with Katy and Kákonyi. He was an instructor at a reserve officer's school in Vršovice, therefore probably serving with IR73. It is however unclear where he lived, but as he was walking the dog Max at the corner of Panská ulice and Na Přikopě he surely lived fairly centrally in Prague. This is however contradicted by the fact that Blahník handed over the stolen dog in Vršovice. The affair with the stolen dog caused his transfer to IR91, an important event as it leads the entire plot of the novel onto a track that in major parts runs in parallel to the author's own career in K.u.k. Heer. On the train to Budějovice where he has to answer to Major General von Schwarzburg it is revealed that he was educated at K.u.k. Infanteriekadettenschule Prag. During the conversation between Ságner and Zykán at the railway station in Győr it becomes clear that Lukáš attended cadet school with Ságner. Lukáš is interested in culture and arts, and the other officers in Budějovice berate him that he doesn't want to mingle with them in his spare time. He detests the brutality he witnesses on the journey to the front. It culminates in Humenné where he gets an urge to get drunk to alleviate the painful feelings. Lukáš is part of the novel until the final scene in the uncompleted book four. Švejk is the officers servant of Lukáš in the first two books - in book three and four he serves Lukáš as his company messenger. Their relationship is often tense due to Švejk's repeated mishaps but deep down the soldier is very loyal to Lukáš and the officer slowly gets to like his subordinate, which is clear by the end of the novel. Before departure from Királyhida, Lukáš becomes commander of the 11th march company. Švejk is promoted to company orderly, and Baloun replaces him as putzfleck for Lukáš. There is little doubt that the main prototype for objlajtnant Lukáš was Rudolf Lukas, an Austrian, later Czechoslovak officer. Still he can't have been the only one as there is little in book one where Lukáš has anything in common with his real-life counterpart. There is for instance every reason to believe that the author attached both biographical details and personal traits from the real life captain Čeněk Sagner to his fictive senior lieutenant Lukáš. Lukáš is also mentioned in Dobrý voják Švejk v zajetí but plays a minor role. Some of the incidents that the novel connects to Lukáš were then related to Dauerling (the dog theft and the Kákonyi affair). [1.14.1] Štěstí Švejkovo nemělo dlouhého trvání. Nelítostný osud přerval přátelský poměr mezi ním a polním kurátem. Jestli polní kurát až do té události byl osobou sympatickou, to, co nyní provedl, je s to strhnout s něho sympatickou tvářnost. Polní kurát prodal Švejka nadporučíkovi Lukášovi, lépe řečeno, prohrál ho v kartách. Tak dřív prodávali na Rusi nevolníky. Přišlo to tak znenadání. Byla pěkná společnost u nadporučíka Lukáše a hrálo se „jednadvacet“. Vejvoda was a plumber from the street Na Zderaze in Prague who always played "mariáš" in a pub behind Stoletá kavárna. According to an interminable anecdote by Švejk he won such an amount at cards that he had to seek police protection. In the story the main character is mentioned no fewer than sixteen times and this is arguably the longest anecdote in the whole novel. See also Hospoda za Stoletou kavárnou. The story was told by Švejk to console Katz who had just played away the money Švejk had lent him so that he (Katz) could buy Švejk back from Lukáš. This was after the field chaplain initially had gambled away his servant at a card game. It has not been possible to link the story and Vejvoda himself to any real event. In the address book from 1907 there is no Vejvoda listed at Na Zderaze, nor is there any plumber with this name in entire Prague. The same goes for older address books. Sancho Panza is mentioned by the author in his reflections on the institution of military (officer) servants. Her Panza is described as a military servant of Don Quijote. Sancho Panza was the servant of Don Quijote in the classic novel by Miguel de Cervantes. Many literary scholars point to similarities between Panza and Švejk, but also add that Švejk as opposed to Sancho Panza was the main character in his novel. [1.14.2] Jisto však je, že v době feudalismu vystupovali v té úloze žoldnéři rytířů. Čím byl Sancho Pansa Dona Quijota? Divím se, že historie vojenských sluhů nebyla dosud nikým sepsána. 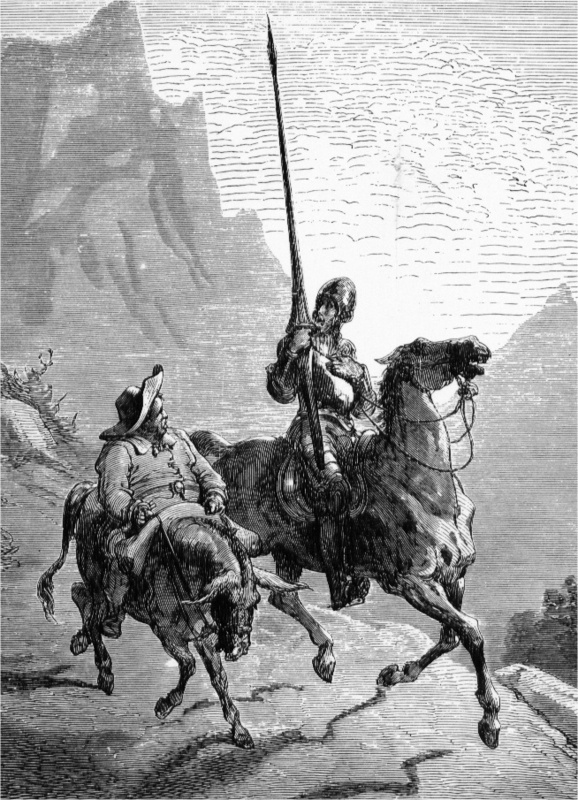 Don Quijote is mentioned by the author in connection with Sancho Panza and the institution of officer servants. The author describes Sancho as Don Quijote's military servant, a position that the strictly speaking never had. Don Quijote is the protagonist of the classic novel Don Quijote de la Mancha by Miguel de Cervantes. The novel is one of the greatest in the Spanish language ever, a universal classic, and one of the most translated. Don Quijote is a novel The Good Soldier Švejk often has been compared to. On 23 August 1926 Swedish literary critic Carl-August Brolander wrote a review of the German translation of book one for the newspaper Dagens Nyheter. Here he declared Jaroslav Hašek a "Czech Cervantes" and also compared him to Rabelais. The French critic Jean-Richard Bloch wrote a similarly enthusiastic review in Les Nouvelles littéraires in 1932. [1.14.2] Instituce důstojnických sluhů je prastarého původu. Zdá se, že již Alexandr Macedonský měl svého pucfleka. Jisto však je, že v době feudalismu vystupovali v té úloze žoldnéři rytířů. Čím byl Sancho Pansa Dona Quijota? Divím se, že historie vojenských sluhů nebyla dosud nikým sepsána. Almavira is mentioned by the author as he is supposed to have eaten his servant Fernando without salt during the siege of Toledo. Almavira is supposed to have been part of the defending party during the siege of Toledo but it is uncertain to what historic event or literary work the author refers. Later in the novel [3.3] Marek mentions an almost identical episode, but the cannibalistic deed is now located to Madrid during the Napoleonic wars (there is no mention of any Almavira or Fernando here). Even this is doubtful as the siege in question was very short. It has not been possible to locate any place in Spain with the name Almavira so it is surely a spelling mistake or the person in question is someone entirely different. It has not been possible to locate a place in Spain named Almavira so here it is probably a question of a typing error, mix-up, or pure invention. The only Almavira a search reveals are roles in The barber of Seville by Rossini and The wedding of Figaro by Mozart. Both these build on a triology of plays about Figaro by Pierre Beaumarchais. Translator of Svejk to Spanish and Catalan, Monika Zgustová "corrects" Almavira to Almavida without solving the main question. Beaumarchais used the name Almaviva anyway. It is still probable that the author was aware of and picked the idea from Figaro. The relation between master and servant fits, but the cannibalism and siege connection does not. Nor does the fact that the duke is supposed to have written his memoirs. The Napoleonic Wars started after Beaumarchais' death, so the chronological connection to the siege of Madrid is also broken. Hašek may well have mixed together multiple stories or invented new ones. Eating a servant may be only a grotesque intermezzo in line with Bretschneider's death [1.6] or the story about a dog who devoured a baby [1.3]. A doctoral thesis by Hamza Messari that compares Švejk and the 16th century Spanish picaresque novel Lazarillo de Tormes offers no further clue, although it mentions Almavira as "some duke". [1.14.2] Našli bychom tam, že vévoda z Almaviru snědl svého vojenského sluhu při obležení Toleda z hladu bez soli, o čemž vévoda sám píše ve svých pamětech, vypravuje, že jeho sluha měl maso jemné, křehké, vláčné, chutí podobající se něčemu mezi kuřecím a oslím. Fernando was the servant of the Hertugen av Almavira. He is said to have been eaten by his master. Fernando can not be identified until we know who the Hertugen av Almavira was (if he was a real person at all). 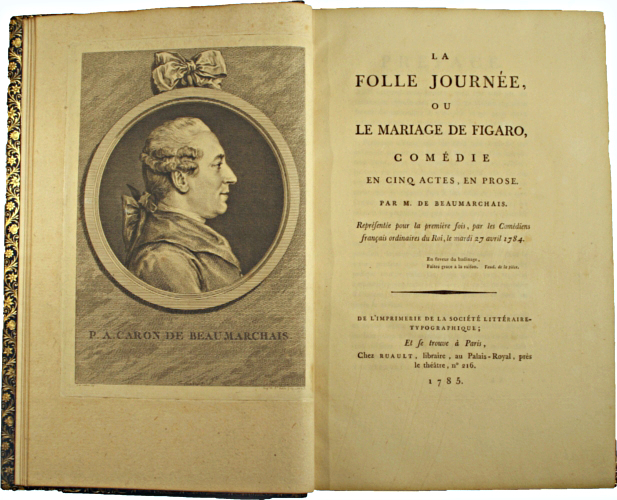 But if the inspiration was Beaumarchais' plays, it could be argued that Figaro inspired the figure of Fernando. Still the grotesque cannibalism-story doesn't fit, and is rather the author's own invention. [1.14.2] Mezi touto novou generací pucfleků nenajdou se tací obětaví tvorové, kteří by se dali sníst svými pány bez soli jako šlechetný Fernando vévody z Almaviru. Kaunitz was a captain who like Švejk had been superarbitrated due to idiocy. He had the habit of walking around with one finger up each nostril. This is what Švejk tells Lukáš when the latter mentions Švejk's reported mental limitations, thus innocently making the point that officers may also be retarded. Any officer with the name von Kaunitz is neither to be found in the address books of Prague nor in Armeeschematismus. The Czech noble family Kaunitz (cz. Kounice) was however well known and it could be that the author borrowed the name from them. There were also a few Kaunitz (without the noble prefix) serving in K.u.k. Heer thourgh the years but it is unlikely that the author was aware of them. Marek was a teacher from a village beyond Pelhřimov who was pursuing the daughter of gamekeeper Špera. He is part of a story Švejk tells Lukáš to underline that nothing is worse than lying and uses Marek as an examlpe of how disastrously this might end. The teacher Marek should not be confused with one-year volunteer Marek who enters the story in [II.2]. In the village of Chvojnov by Pelhřimov actually lived a teacher Karel Marek. In Zlatá Praha (Golden Prague) from 1892 it is revealed that he had won in a logical puzzle. In the yearly report of the gymnasium in Pelhřimov (1896-1897) another Karel Marek from a village nearby is mentioned. This time it is in Horní Cerekev, but whether it is the same person or if Hašek may have known about about him/them is pure speculation. [1.14.3] „Poslušně hlásím, pane nadporučíku, že rozumím. Není nic horšího, než když člověk lže. Jak se začne zaplítat, tak je ztracenej. V jedný vesnici za Pelhřimovem byl nějaký učitel Marek a ten chodil za dcerou hajnýho Špery, a ten mu dal vzkázat, že jestli se bude s holkou scházet v lese, že mu, když ho potká, postí do zadnice z ručnice štětiny se solí. Špera was a gamekeeper from a village near Pelhřimov who resented that the teacher Marek was pursueing his daughter. This was according to a story Švejk told Lukáš when they first met. It has not been possible to find a source of inspiration for this character. Balabán was an unusually ugly dog of mixed race that Švejk once had bought. The dog is mentioned in the kynological discourse he subjects his superior Lukáš to on the day the two first met. This dog appears in several of Jaroslav Hašek's stories. It was so ugly that dogs, other animals and people avoided him. From one of the stories, Kolik kdo má kolem krku, it is apparent that the author actually owned a dog called Balabán. Balabán also appears in Dobrý voják Švejk v zajetí (1917), the second version of the good soldier. Here it is the name of the dog that Švejk stole in Bruck an der Leitha for the benefit of Dauerling. In this story the dog is a Boxer and even Biegler gets involved with him. Tak ho přitáhl k Dauerlingovi, který vyjasnil tvář. Nijak mu nevadilo zoufalé vzezření boxerovo. Ptal se, jak jmenuje. Švejk pokrčil rameny: "Já mu říkal po cestě Balabán." "Ty hlupáku," rozkřikl se Dauerling, "takový pes se musí jmenovat nějak vznešeně, počkáme, až přijde Biegler, to je chytrá hlava, ten si něco vymyslí." [1.14.3] Já jsem jednou koupil takovýho psa Balabána, von byl po těch svých tátech tak vošklivej, že všichni psi se mu vyhýbali, a já ho koupil z lítosti, že je takovej vopušténej. Mehmet V. Reşat is mentioned indirectly when Švejk reads in a newspaper that the Sultan has honoured Emperor Wilhelm with a war medal and he himself didn't even have a small silver medal. The sultan is thus not mentioned directly by name. Mehmet V. Reşat was Sultan of the Ottoman Empire (see Turkey) from 1909 to 1918. He ascended the throne after the coup by the Young Turks but had limited power. His only significant political act was to formally declare Jihad against the Allies on 11 November 1914. He was the empire's Sultan no. 35 and died only months before the empire collapsed. His reign was marked by enormous territorial losses for The sick man of Europe. North-Africa except Egypt and almost all of the Balkans was lost from 1912 to 1913. During WW1 the Arabic territories and Cyprus followed. Circumstances strongly suggest that the decoration that Švejk read about took place in March 1915 as a quote from Roskvět's "Brief Chronicle of the World War" is to the letter reproduced in the novel. The content of the "Chronicle" also appeared is newspapers like Národní politika, and many of these brief quotes appear throughout this chapter of the novel. The chronicle refers to the date of decoration as 24 March 1915. Already on 9 March 1915 the Turkish news agency Agence Milli reported that the Sultan had telegraphed the Emperor and congratulated him on the great victories in the east. In the same telegrammme it is revealed that the Emperor will be offered the Imtiaz War Medal as an expression of the Sultans admiration. On 25 March Agence Milli reported that Goltz Paşa had left Constantinople for Berlin in order to personally forward the award. It also added that the war medal was specially issued for the Emperor. In April it was revealed that the Emperor had responded by awarding the Sultan the Iron Cross 1st Class. Again Goltz Paşa performed the formal decoration. He actually brought the medal back with him from the trip to Berlin, and the Sultan received the medal on 11 April. Bělčický was a confectioner who is mentioned by Švejk when he refuses to let Katy into the flat of Lukáš. Bělčický let in a stranger who had then run away with the cash till. It is clear that the confectioners shop was located in the street where Švejk lived. Bělčický probably has a real model and there were several confectioners in the area where we assume the Good Soldier lived. Na Bojišti had two in 1910, and there was also one in Vávrova třída. Still none of them are listed with Bělčický as proprietor, and even when including all of Prague there appears to be no confectioner with this name. A certain Václav Pospíšil owned several confectioner shops in this area, one of them in No. 10, two houses down from U kalicha. It is therefore possible that some Bělčický was the branch manager here. [1.14.4] Teď zavřu byt, tak bych prosil, abyste laskavě vodešla. Mně není nic oznámenýho a žádnou cizí osobu, kterou neznám, zde nemůžu nechat v bytě. Jako jednou u nás v ulici u cukráře Bělčickýho nechali jednoho člověka a on si votevřel šatník a utek. Karl Franz Joseph is mentioned indirectly as "the Austrian heir to the throne" when Švejk escorts Katy to the barracks where Lukáš teaches. The soldier enters a conversation with the guard and wears an expression "as stupid as that seen on a picture with the Austrian heir to the throne in KSV". He enters the plot again in [3.1] during the dream of cadet Biegler on the way to Budapest. Here he is mentioned under his full name as there is a portrait of him hanging on the wall at K.u.k. Gottes Hauptquartier. Karl Franz Joseph (Karl Franz Joseph Ludwig Hubert Georg Otto Marie von Habsburg-Lothringen) was in 1915 heir to the Austrian and Hungarian thrones. He was the eldest son of Archduke Otto, brother of Franz Ferdinand. He became emperor and king when Franz Joseph I died on 21 November 1916. His reign was less repressive than his predecessor's as he gave an extensive amnesty to political prisoners. He also tried to negotiate a separate peace with the Entente, albeit without notifying his allies. Karl was the last emperor of the Habsburg family. He was beatified in 2004. Before he ascended the thrones he visited the front frequently, and he is frequently shown in picture-magazines like Wiener Illustrierte Zeitung. In a Švejk context the most important photo of him is the one that was printed in Kronika světové války and is mentioned in the novel. The picture shows the heir to the throne together with two pilots who have downed a Russian plane. It was printed also in other newspapers, and then with additional explanatory details. The two airmen shown were the Germans Johann Offermann and Erwin von Sprungmann. The photo was taken by Czernowitz in Bukovina (now Чернівці Ukraine) and hails from the first half of 1915. The heir to the throne visited Černovci on 19 April 1915 and the photo was probably taken during this visit. [3.1] Uprostřed pokoje, ve kterém po stěnách visely podobizny Františka Josefa a Viléma, následníka trůnu Karla Františka Josefa, generála Viktora Dankla, arcivévody Bedřicha a šéfa generálního štábu Konráda z Hötzendorfu, stál pán bůh. Kusmanek is mentioned by Švejk in a conversation about how the the war progresses. Kusmanek is said to have arrived in Kiev. This conversation takes place whilst awaiting orders from Lukáš about what to do with Katy. Švejk refers to him as General Kusmanek. Kusmanek was an Austrian infantry general and commander of the Przemyśl fortress during the two Russian sieges in 1914-1915. He was considered one of the more capable Austrian commanders and earned the nickname "The Lion of Przemyśl" in 1914. After the capitulation on 22 March 1915 he and the nearly 120,000 strong garrison became prisoners of war in Russia. Kusmanek was the son of a highranking police officer, Josef Kusmanek, who for many years headed the security police in Vienna. Already as a 19-year old he graduated from the military academy in Wiener Neustadt. His career then progressed via, amongst others: IR63, Kriegsministerium, IR73 and from 1903 General Staff. On 16 February 1906 Oberst Kusmanek w2as even invited to an official dinner by Franz Ferdinand. In 1908 he became commander of 65th Infantry Brigade in Győr, and from 4 May 1910 by 3rd Infantry Division in Linz, From February 1911 he was head of 28th Infantry Division in Ljubljana (Laibach). In Linz he was replaced by Joseph Ferdinand, a member of the imperial family. Kusmanek this had an unusually short term here, and it is tempting to suggest that he was transferred to make way for a Habsburger. Kusmanek was promoted to Feldmarschall-Leutnant (FML) on 1 November 1910 (with a resulting audience with the Emperor). he was knighted on 1 November 1913 and chose the post-fix "von Burgneustädten". He became fortress commander in Przemyśl on 1 February 1914, a transfer that was to determine his fate. The information Švejk gives refers to events on 26 March 1915, connected to Kusmanek's arrival in Kiev as prisoner of war. The author has clearly used news items for this passage, and at first glance they seem to be from Národní politika who 4 April printed a snippet that was almost identical to the quote in the novel. The book Světová válka 1914-1915 slovem a obrazem, page 505, contains the same quote and here it is to the letter identical to the wording in the novel. That this is indeed the author's source is confirmed by the sub-title of the page: Kronika světové války. To remove any doubt this page even contains a picture of the successor to the throne Karl Franz Joseph, with subtitles exactly as those used in the novel a few lines earlier. Newspapers provided more comprehensive information. Kusmanek arrived in Kiev on an express train, first class, on 25 March. This was only three days after the capitulation of Przemyśl. He was very well treated in Kiev and even stayed as a guest of the governor. Furthermore his stay in Kiev was of a temporary nature, he was to be sent to the inner parts of Russia for permanent internment. Reports in the Finnish press (and later also in Austria-Hungary) reveals that we was interned in Nishny Novgorod. He arrived here in late April via Moscow. In April there were also reports the he was internet in the Voronesh Gubernate but this is probably not true. In Nishny Novgorod the authorities provided rented accommodation and he was allowed to move freely two hours every day. In the beginning he reportedly lived in a hotel. As a prisoner of war he was not allowed to visit public houses, but other reports claimed he was able to move around more or less freely. In the beginning the conditions were good but deteriorated towards the end of the war. In February 1916 he complained to the Red Cross that the authorities had confiscated material he had prepared about the reasons for the fall of Przemyśl. He had collected the material in anticipation of an investigation on returning to his homeland. In early 1918 Austria-Hungary and Russia negociated a prisoner exchange where a number of higher officers were involved, amongst them those captured at Przemyśl. On 12 February 1918 Kusmanek left Nishny Novgorod and travelled via Moscow, Petrograd, Vilnius and Warszaw to Vienna. On the 18th he arrived at Nordbahnhof and was greeted by several dignitaries and high ranking officers. In January 1918 news articles appeared, claiming that he had travelled to Stockholm. Allegedly he and other generals stayed there in anticipation of the conclusion of the peace treaty with Russia, but this is only one of several false news stories regarding his whereabouts during the war. Three days after returning Kusmanek stood before a military court of honour, a formal investigation that all repatriated officers had to go through. As expected the court cleared him of any wrongdoings. The day before (20 February) he had been invited to see the Emperor, and in March he was awarded the honorary title Geheime Rat. During the war he had in absentia been promoted to Generaloberst. Kusmanek settled in Vienna after the war but was not very active in public life. In 1920 rumours circulated that he had become commander of the Ukrainian Boslhevik's 6th army, a rumour that was soon refuted. In 1923 he suffered a stroke from which he never recovered. The last years of this life he was very ill. Kusmanek died in 1934 and is buried at Wien Zentralfriedhof. Katy was the wife of the hops wholesaler Wendler and one of the ladies of Senior Lieutenant Lukáš. She played a prominent role in this chapter as she appears out of the blue to visit the lieutenant when he in turn is expecting Mrs Micková from Třeboň. In this delicate situation Švejk comes up with the idea to send a telegram to her husband mentioning her whereabouts. This works and Mr. Wendler comes and fetches the young Katy, which leads to a long and detailed conversation with Lukáš about the war and international hop trading in times of crisis. Before this happens Katy had commanded the good soldier to turn the residence of Lukáš inside out and had also enjoyed his company in the bedroom after he had rearranged the flat to her liking. Švejk had received strict orders to please the lady in all her wishes and in this respect he only carried out his duty as a soldier and gentleman. It has not been possible to identify any real-life model for Katy although Jan Berwid-Buquoy makes an unconvincing attempt to link her to some Anna Wendler from Liberec. Rudolf Lukas allegedly had a relationship with her in Budějovice in 1915. The story has not been confirmed but it is altogether possible because Lukas spent time in the city between 1 April 1915 and 1 June 1915, recovering after having been wounded in Carpathians on 15 March. There are however many discrepancies: this lady was not the wife of a hop trader and she wasn't even married. The only connection to some Mr. Wendler was her uncle who allegedly was co-owner of a brewery. If there is substance to this theory it is unlikely to be more than a borrowed name. It can be added that there was no Wendler associated with the city's two breweries in 1914 (the uncle could of course have been the brother of Anna's mother). Indeed there was no Wendler in the address book at all. If there is substance to this theory it is unlikely to be more than a borrowed name , and more likely gossip or pure invention. If the episode with Katy is inspired by some real events, it probably has nothing to do with Rudolf Lukas at all. Note that other episodes involving the senior lieutenant like the dog theft are found also in Dobrý voják Švejk v zajetí. Here they don't involve Lukáš but rather Dauerling and the same goes for the scandal with Kákonyi. Ich muß unbedingt bei Dir ein paar Tage gastieren. Dein Bursch ist ein großes Mistvieh. Ich bin unglücklich. Micková was a lady from Třeboň who Lukáš expected a visit from just when Katy appeared. It has not been possible to identify any real-life model for Micková. [1.14.4] Milý Jindřich byl určitě v ošklivé situaci. Manželka pronásledovaná manželem přijede k němu na několik dní na návštěvu, právě když má přijeti paní Micková z Třeboně, aby po tři dny opakovala to, co mu pravidelně poskytuje každého čtvrt roku, když jede do Prahy dělat nákupy. Wendler was an intelligent hop merchant, married to Katy. He came to visit Lukáš to fetch his wife who had ran away from home. First, Wendler listen impatiently to Lukáš and his description of the war effort, went on to complain about Katy and then ended up describing the hopeless situation in the European hop market now just before Christmas in 1914. Still in the end his wife went home with him! Wendler does not have any obvious model, but many details from the conversation with Lukáš have a direct relation to events that took place in late March and early April 1915. Even literal quotes from the newspapers found their way into this conversation, mainly from official battle reports. All the place names from the Western Front that Wendler mentions appeared in official bulletins and newspaper summaries between 26 March and 4 April 1915, so the author has obviously had access to newspapers or magazines from this period. The main source is no doubt Kronika světové války. The address books of Prague do not show up any Wendler who had any connection to hop trade. There were in fact very few people named Wendler in the Czech capital before WW1. The best known Wendler was Antonín who owned a factory that produced gates and fences. He also made equipment for the brewing industry. That said it is clear from the context that the couple didn't live in Praha as Wendler told his wife that the train leaves at 2:20. He had arrived the same morning. See Katy for a possible connection to some Wendler in Budějovice. Hali Bey is mentioned by Lukáš when he describes the positive war situation for hop-trader Wendler. Lukáš could inform his guest that Hali Bey, speaker of the Turkish Parliament, had arrived in Vienna accompanied by Ali Bey. Hali Bey (correct Halil Bey, later he took the name Halil Menteşe) was a Turkish politician and one of the leaders of the Young Turk Movement, and for a while chairman of the associated Committee of Union and Progress. Halil served as MP from 1908 to 1918. He was educated as a lawyer, and completed part of his studies in France. Some time before December 1909 he became chairman of the Committee, the de-facto ruling party after the Young Turk Revolution (1908). In February 1911 he accepted the post of minister of the interior after some deliberation. It was a critical period with considerable unrest amongst the minorities of the empire. His first task was to deal with a Albanian rebellion, and he strived to alleviate the tension by allowing the Latin alphabet to be used in Albanian schools. On 15 May 1912 he became speaker of the lower chamber of the Turkish Parliament (re-elected 13 May 1914), on 24 October 1915 foreign minister and in 1917 minister of justice. According to US ambassador Henry Morgenthau Halil didn't approve of the genocide of the Armenians, but still defended it officially. In an interview with Berliner Tageblatt in 1915 he stated that "the Armenians are traitors, we must finish with them". Halil was politically active also in the new Turkish republic that was formed after the collapse of the Ottoman empire. In March 1915 he set out on a journey to capital cities on the Balkans and in Central Europe. On this journey Halil Bey stopped in Sofia (14 March), Bucharest (15 March), Budapest (16 March), Vienna (18 March), Berlin (from 19 March), and again in Vienna (28 March). The main purpose of the journey was to meet leading foreign policy makers in person, particularly in Berlin where he stayed for a longer period. It is the visit to Vienna on 28 March 1915 that is directly referred to in the novel. Everything indicates that the author fetched the fragment about Hali Bey and Ali Bey and their arrival in Vienna directly from Světová válka slovem i obrazem (see Kronika světové války). On page 506 in this publication the phrase that is used in the novel can be found, including the erroneous spelling of Halil (in "Kronika" and in the novel he is "Hali"). The same quote also appeared in Rozkvět on 10 April and in Národní politika on 4 April. In the two latter publications the wording is however slightly different and Halil is here correctly spelled. Vice President of the Turkish Parliament, Who Was Sent to Berlin to Take Back to Turkey Mohammedan Prisoners Captured from the Allies. Ali Bey is mentioned by Lukáš when he explains Wendler Turkey's role in the war. He could inform his guest that the Turks are holding their ground and that Ali Bey and Hali Bey had arrived in Vienna. Ali Bey no doubt refers to Emir Ali Paşa. The author uses the term "bej" but this is an misquote that appeared in some Czech newspapers, amongst them Národní politika, Rozkvět and Kronika světové války. Emir Ali was the son of the Algerian national hero Abd El-Kader El Djezairi, who from 1855 lived in Damascus. Emir Ali Paşa was from May 1914 member of the Lower Chamber of the Turkish Parliament and at the same time he was first vice-chairman of the chamber. In mid March 1915 he travelled to Berlin to negotiate about transfer of British and French Muslim prisoners of war to the Ottoman Empire. The plan was to employ them in the war against Great Britain. On the way back he stopped in Vienna. The stay lasted from 28 to 30 March 1915 and he stayed at Hotel Bristol. He travelled from Berlin to Vienna together with Halil Bey. From Vienna he returned directly to Constantinople. The quote from Národní politika, Rozkvět and Kronika světové války is nearly identical to the quote in the novel and several other snippets from the same pages appear in the conversation with Wendler. It is this brief news item about the visit in Vienna that six years later found its way into a world famous novel. The incorrect news items in the Czech press that the author made use of complicated the effort to identify Emir Ali, but a comparison with similar quotes from the Viennese press puts all doubt to rest. Yusuf Hikmet Bayur, Türk İnkılabı Tarihi, vol 3, part 3 (Türk Tarih Kurumu yayınları, VIII. dizi, sayı 14, Ankara 1991 [last reprint]) p. 422 states that Emir Ali Paşa, deputy chairman of the Meclis-i Mebusan, was the eldest son of Abd el-Kader. The author, historian, born 1881, was an „eye-witness“, he was in his adult life when Emir Ali was elected in 1914, and his account seems reliable enough for me to say that Emir Ali must have been the son of Abd el-Kader. Liman has according to Lukáš been appointed supreme commander of the Turkish army of the Dardanelles. This was in the conversation with Wendler. Lukáš could also inform that Liman held the rank of of marshal. Liman was a German cavalry general and Turkish marshal, best known for his role as advisor and military commander in Turkey. Liman was instrumental in thwarting the British-French expedition force by the Dardanelles in 1915. In 1913 Liman was given the task of re-organizing the Turkish army after the disastrous setbacks in the Balkans Wars of 1912 and 1913. Initially he was Corps Commander of Constantinople but was on 24 March 1915 appointed commander of the newly formed 5th Army and it is the news of this appointment that appears in the words of Lukáš in the novel. Towards the end of the the war he was commander of the Asia-Corps, and after the war he was arrested by the British, accused of war crimes against Armenians and Greeks, but released due to lack of evidence. He returned to Germany in 1919 and settled in Munich where he lived for the rest of his life. The timing of the appointment mentioned by Lukáš is at odds with historical facts. It is likely that Hašek used written material (war calendars or newspapers) from 1915 to construct this part of the plot, but "moved" the event to December 1914. The phrase that Lukáš uses is to the letter identical to that found in Národní politika 4 April 1915 and also in Kronika světové války. Similar time-shifts occur elsewhere in the novel. See Siedliska. When explaining the war situation to Mr. Wendler (December 20th, 1914), Lukasch mentions that Field Marshall Liman von Sanders has been made commander in chief of the Turkish Army at the Dardanelles: Otto Liman von Sanders was a Prussian General, and Ottoman Marshall, he was made CiC of the Ottoman 5th army (Dardanelles) March 24th, 1915 (cf. Liman von Sanders, Fünf Jahre Türkei, Berlin 1920, p. 77). Goltz Paşa has according to Lukáš arrived in Berlin from Constantinople. This is at least what he comforts Wendler with his account about the situation in the war. Goltz Paşa was a German general, military historian and author. From 1883 he was responsible for reorganizing the Turkish army, and after returning to Germany in 1895 he held several high positions; amongst them army corps commander and army inspector. In 1914 the now retired general was appointed military governor in occupied Belgium, and from December he became an adviser to Turkey. The trip that Lukáš refers to actually occurred: Goltz arrived in Berlin from Constantinople on 29 March 1915. The phrase about Goltz is word by word identical to an item in Kronika světové války in 1915, and then in Národní politika on 4 April 1915. This is one of many items from the conversation between the hop trader and the officer that are be borrowed from the same source. He returned to Constantinople on 4 April 1915 and stopped in Vienna for a conversation with Franz Joseph I..
Goltz died in Baghdad 1916 of typhus and was buried there immediately, as the transport of a body died from an infectious disease was prohibited. After a couple of months(?, still in 1916) a solution was found and his coffin was transferred to Istanbul and re-buried in the German military cemetery at Tarabya, in the grounds of the German Embassy's summer residence. In 1918 the Kaiser visited the grave there. It had been planned to move the coffin to Germany after the war, but this did not happen and his grave is still there. Enver Paşa is one of several Ottoman politicians and officers that Lukáš mentions when trying to reassure Wendler about the war contribution of the Ottoman Empire. He can reveal that Enver has been decorated by the emperor. Enver Paşa (İsmail Enver) was a Turkish politician and general. He was minister of war during World War I, and by some regarded as de facto dictator. In retrospect he is seen as a poor military leader; the war against Russia was not a success. He is also largely held responsible for the mass killings of Armenians in 1915, whom he had accused of being fifth columnists. When the war ended, he fled to Germany and later to Russia. After first having co-operated with the Soviet government he turned against them and in Tajikistan he was killed fighting the Red Army. Enver was indeed decorated by Franz Joseph I. together with Usedom Paşa and Cevat Paşa, exactly as Lukáš told Wendler. The decoration was announced on 30 March 1915. He was awarded the medal Militärverdienstkreuz 1. klasse. There was also a fourth decorated officer mentioned in the official news. Kontreadmiral Merten was however left out by the author. Usedom Paşa is mentioned when Lukáš tries to reassure Wendler about the war situation. Vice-admiral Usedom Pasha has been decorated by our Emperor he reveals. Usedom Paşa was a German naval officer and ultimately vice-admiral who from August 1914 led the special command of the German navy in Turkey (Sonderkommando Kaiserliche Marine Türkei). He also led the Turkish forces in the Battle of the Dardanelles and was given a large share of the credit for repealing the Allied invaders. Like with the other names that Lukáš mentions for Wendler regarding the Turkish war effort the quote is cut directly from Kronika světové války. The background is the fact that Usedom on 30 March 1915 was awarded the medal Militärverdienstkreuz 1. Klasse by emperor Franz Joseph I..
Cevat Paşa was according to Lukáš a Turkish general who had been decorated by our emperor. Cevat Paşa (Cevat Çobanlı) was a Turkish general and commander of the Gallipoli fortress who distinguished himself in the battle of the Dardanelles on 18 March 1915. He was also given the nick-name Hero of 18 March. Cevat was awarded the title Paşa after the battle, was congratulated by Emperor Wilhelm II., and from newspaper clips it is obvious that he was educated in Germany. At the end of the month he was awarded Militärverdienstkreuz 2. klasse by emperor Franz Joseph I. and this is the event that Lukáš refers to. The entire sequence about the decorations has been cut from Kronika světové války. In listing the decorations Kronika světové války, Národní politika and other publications also mention a fourth officer. This man was rear admiral Mertens but unlike the three others he is never mentioned by Wendler. Studies of the novel's manuscript however reveal that the admiral was extremely close to achieve a place in world literature in the company of Enver Paşa, Usedom Paşa and Cevat Paşa. In the manuscript, after "Dževad paša", follow the letters "a kon" but these have been crossed over so the author obviously changed his mind at the last moment. There is no doubt that "kon" here is the start of "kontredmirál" which is the exact wording in Kronika světové války. It could also be added that Mertens is misspelt and that his rank in 1915 was Vizeadmiral and not Konteradmiral (rear admiral). The real name of this German naval officer serving in the Ottoman armed forces was Johannes Merten (1857-1926). He was pensioned in 1910 but after the outbreak of war he took up a command in the Turkish army by the Dardanelles. He was also a well-known pilot and in 1912 newspapers refer to him as president of the German airmen association. San Giuliano was mentioned by hop trader Wendler who evidently did not know that San Giuliano had died earlier in the year. Wendler is annoyed because Italy as an ally of the Central Powers still sticks to her neutrality, and he wonders if San Giuliano is asleep. He had after all renewed the treaty woth the Central Powers in 1912. The conversation between Wendler and Lukáš took place shortly before Christmas in 1914, two months after the death of the Italian foreign minister, so San Giuliano was definitely "asleep". San Giuliano was an Italian politician who held the post of Foreign Secretary when the war started. He advocated neutrality but was already dead when Italy entered the war on the side of the Entente, on 23 May 1915. His real name was Antonino Paternò Castello. Paternò-Castello originated from a noble family a Sicily, and received a good education in Vienna, London and Catania. From 1882 he was a member of the national assembly, from 1889 minister of various ministries, and from December 1905 Foreign Secretary. Politically he was liberal and anti-clerical, in foreign affairs he tried to balance between the blocks to the benefit of Italy. Before he became minister of foreign affairs he had been ambassador to London and Paris. His successor as Foreign Secretary was Sidney Sonnino who was one of the politicians who eventually led Italy to declare war on her formal allies. Many fragments from the conversation between the hop trader and the officer are picked from Kronika světové války, and probably this also applies to details around San Giuliano. In this case it is from page 511 where the chronicle mentions that San Giuliano as foreign minister renewed the Triple Alliance treaty in 1912, exactly as Wendler says. [1.14.5] Chmel mně ve skladištích hnije, uzávěrky domácí jsou slabé, export rovná se nule, a Italie zachovává neutralitu. Proč Italie obnovovala ještě v roce 1912 s námi trojspolek? Kde je italský ministr zahraničních záležitostí markýz di San Giuliano? Co dělá ten pán? Spí nebo co? Víte, jaký jsem měl do vojny roční obrat a jaký mám dnes? Blahník was a dog-trader and conspired with Švejk in the attempt to steal a dog for Lukáš, and he physically stole the stable pincher Fox in [I.15]. The dubious deed was planned in a small pub by the Zamecké schody in Malá Strana. Blahník In his story Můj obchod se psy (My trade with dogs) Jaroslav Hašek introduces a person who to a degree assumed the role of Blahník, a certain Leopold Čížek. surely has a real life model and to judge from the plot that person must have worked for the kennel of Svět zvířat at Klamovka. Puntík was a black spitz dog from Klamovka, mentioned in the conversation between Blahník and Švejk as they were planning the dog theft. Puntík means 'Spot'. [1.14.6] Tak jsem musel koupit kotletu. Dal jsem mu ji očichat a běžím, pes za mnou. Paní křičela: ,Puntíku, Puntíku,’ ale kdepak milej Puntík. Za kotletou běžel až za roh, tam jsem mu dal řetízek na krk a druhej den už byl v psinci nad Klamovkou. Fox was the stable pincher who was to be stolen by Blahnik and Švejk and given to Lukáš. He was renamed Max when he got a new owner and a new impressive pedigree. Fox is first mentioned when Švejk ingratiatingly asks the maid who is walking the dog about the animals eating habits. The dog stories have like most elements in Švejk clear connections to the authors own life and experiences. For a short while in 1910-11 Jaroslav Hašek ran his own "cynological institute" by Víla Svět Zvírat on Klamovka. He falsified pedigrees, just like Švejk did. On 31 March 1915 Prager Tagblatt printed a small advert that asked for news about a stolen dog. The advert has some striking links to the dog story in the novel. It requsted information about the dog to be delivered for a 30 crown at Hotel Black Horse at Na Přikopě. This is the very street were Colonel Kraus encountered his stolen pet. We know that Jaroslav Hašek made use of newspaper items from exactly this period when he wrote this chapter. Several snippets from these publications are more or less literally quoted in the novel, particulalrly in the conversation between Wendler and Lukáš. See Kronika světové války for more on this theme. Pejchar was a butcher from Protivín, mentioned when Švejk talks to the maid of Kraus, who is walking the soon to be stolen dog. Švejk tells her that Pejchar is his brother. Jareš is mentioned when Švejk says he is the son of a Jareš from Ražice. This was in the conversation with the maid of colonel Kraus. (Antonín) was the author's grandfather. See Jareš. Vydra was a factory owner whos Saint Bernhard was stolen, this is evident from a conversation between Švejk and Blahník as they are planning the dog-theft. Fuchs was the owner of a stationary shop where Blahník bought a blank pedigree form for Švejk to fill in. [1.14.6] Pak jsem ho, když se nažral, uvázal na řetízek a táh jsem ho přes Václavské náměstí na Vinohrady, až do Vršovic. Po cestě mně vyváděl pravé divy. Když jsem přecházel elektriku, lehl si a nechtěl se hnout. Snad se chtěl dát přeject. Přines jsem s sebou taky čistý rodokmen, kterej jsem koupil u papírníka Fuchse. Ty umíš padělat rodokmeny, Švejku. Bülow was the name of a kennel in Leipzig (and surely its owner) where Max, according to the pedigree, was supposed to hail from. Kahlsberg was a dog; the fictive father of Max and had a first price from the stable pinscher exhibition in Berlin in the year of 1912. Trautensdorf was a dog; the fictive mother of Max and had earned a gold medal from the Nuremberg society for the breeding of thoroughbred dogs. Busenthal was a dog; the fictive grandfather of Max, on the mothers side. He was a stable pinscher.